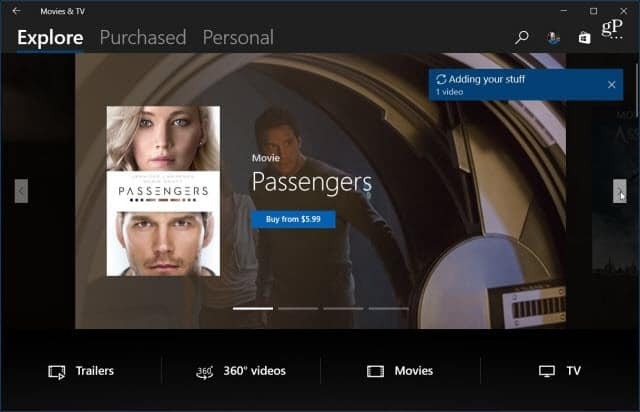 The Movies & TV app in Windows 10 Creators Update has received a new interface and set of features that make it more appealing than the current version. With the final version of Windows 10 Creators Update expected to be released soon, in addition to the OS, Microsoft has also been making changes to its built-in apps. The Movies & TV app has received a new interface and set of features that should make it more appealing than the current version. There are three main views in the app – Explore, Purchased, and Personal. When you first launch it, you’ll find that it feels more unified than the previous version. Here’s a look at what you can expect. Note: While this will give you a good idea of what’s coming, keep in mind these screenshots are from the Insider build 15058 and a there may be some minor variations in the final release. The current version of the Movies & TV app has a plain interface and lacks the features of other third-party programs. Here is what the Movies & TV app looks like in Version 1607 aka Anniversary Update. The new version has a more enhanced user interface as well as some interesting new features. 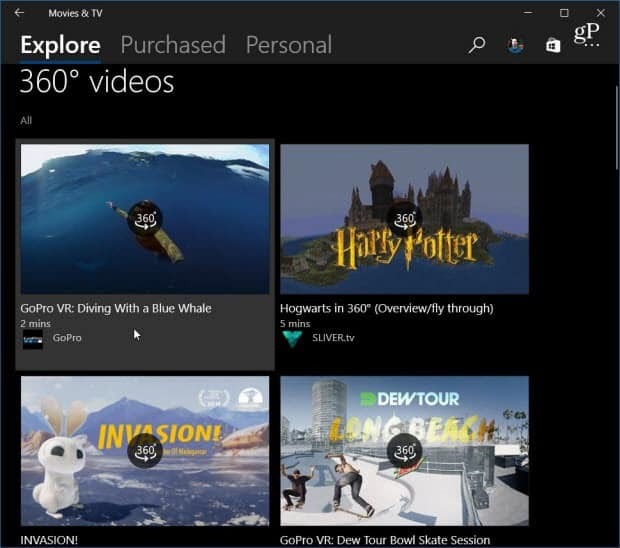 The Explore view provides a front-end to movies and TV you can rent or buy in Windows Store, it includes movie trailers and 360-degree videos. Here is what the new version of the Movies & TV app looks like in Creators Update. While 360 videos work best when paired with a VR headset (or as Microsoft calls it “Mixed Reality”), you can still drag the video to different angles with your mouse or finger on a touch-enabled device. 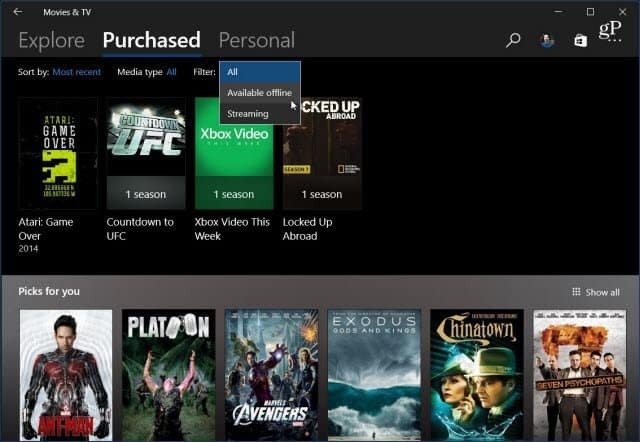 The Purchased view displays a list of the movies and TV shows you have bought. The Personal view shows the content stored on your PC, external drives, and network locations. Another new feature that we covered previously is called Compact Overlay. This is basically a picture-in-picture mode that lets you watch videos in a smaller resizable screen while you’re doing other work at the same time. 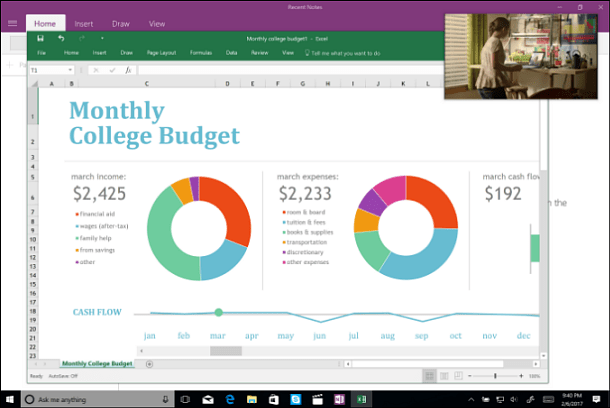 Compact Overlay is a new picture-in-picture type feature for Windows 10 Creators Update. 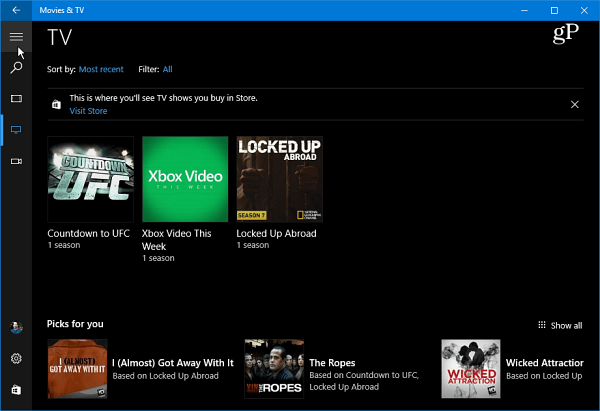 If you have been waiting for a decent video player for Windows, this latest version of the Movie & TV app is a step in the right direction. When you make the move to Creators Update you’ll find several improvements to its built-in media apps including Groove Music, Photos, and a new eBook section in the Store. I am on the fast ring with Build 15058 installed but I am not seeing the new version of the Movies app, any reason? Microsoft stopped updating apps for Fast ring builds for the past few months. Your best bet is to flip to the slow ring and keep manually checking for app updates and flip back to the Fast ring.